It's time to get loud and creative to conquer a growing threat. I was nine years old when my mom first bought my sister and me a box of endangered species chocolates. Each treat came with a baseball card-style fact sheet and photo of a threatened animal. My sister and I fought over who got to eat the cutest creature. It was unusual, but it worked. The tigers and whales on my Lisa Frank Trapper Keepers suddenly carried a new meaning, as bite by bite I learned about their plight. Whether through candy bars, films or classrooms, the world must understand the threat of species extinction. This problem impacts animals and humans alike. Scientists predicted last year that one-third of animal species face huge losses this century because of the effects of climate change. This loss of "species richness" is a loss for us, too. "The functions ecosystems provide for humans across the whole global land surface will be very significantly reduced," lead scientist Dr. Rachel Warren explained. Beyond the melting sea ice, shifting temperatures and disrupted seasons threatening humans, the harm climate change inflicts on animals affects us as well. Take polar bears and bees, for example: The loss of ice forces some hungry polar bears to spend more time on land, potentially increasing clashes with humans. Climate change is detrimental to pollinating bees, which in turn is a problem for human food production. Habitat loss, poaching and other human-tied threats also dwindle the population of endangered species. The key word here is "human." We possess the power to curb our emissions, save habitats, halt the illegal wildlife trade and steer thousands of animals away from the edge of extinction. 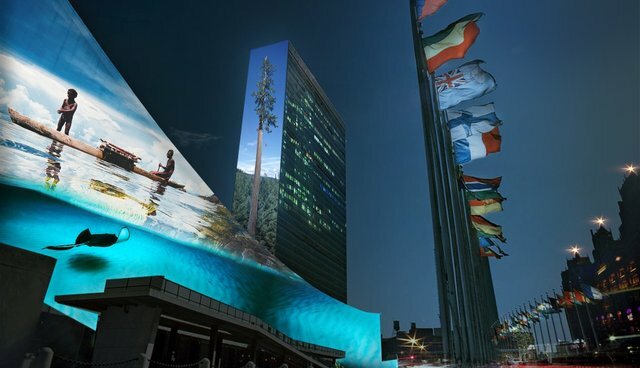 Saturday, September 20, The Dodo is teaming up to help sponsor an event illuminating the United Nations Headquarters in New York to raise awareness of climate change and species extinction. This will be just the beginning of a global effort to protect the planet's most threatened animals. Why is The Dodo dedicating our entire site to endangered species? Because there is still time for humans to make a difference. Whether it's through unwrapping individual squares of chocolate or projecting the truth at the hub of all nations, awareness of Earth's most threatened species is needed, before it's too late. Learn more about the illUmiNations event Saturday, September 20 and efforts to protect endangered species here.